I tried making pulled pork for the first time this summer. 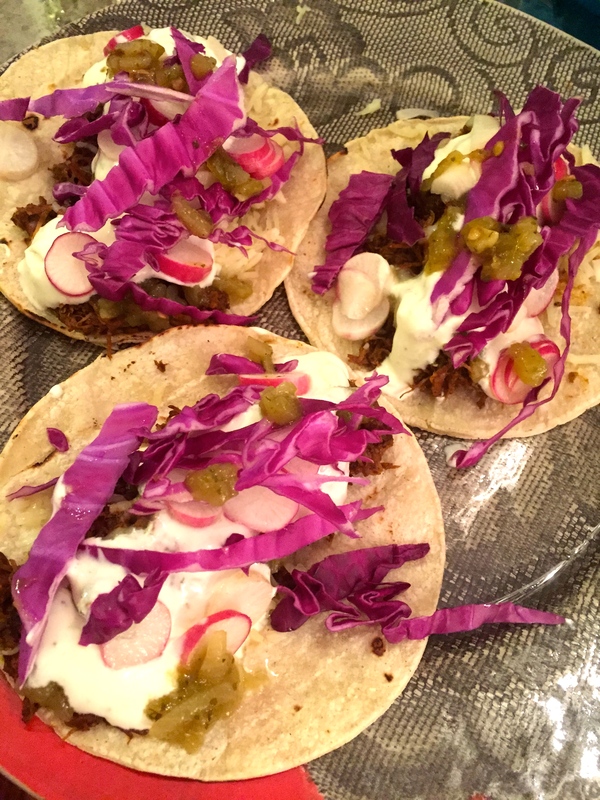 I was really into making tacos and after having success with shrimp and chicken I had to try my hand at pulled pork tacos. I used a boneless pork shoulder, but instead of roasting it whole, I decided to cut it up into large chunks of meat and slow cook it in the oven. 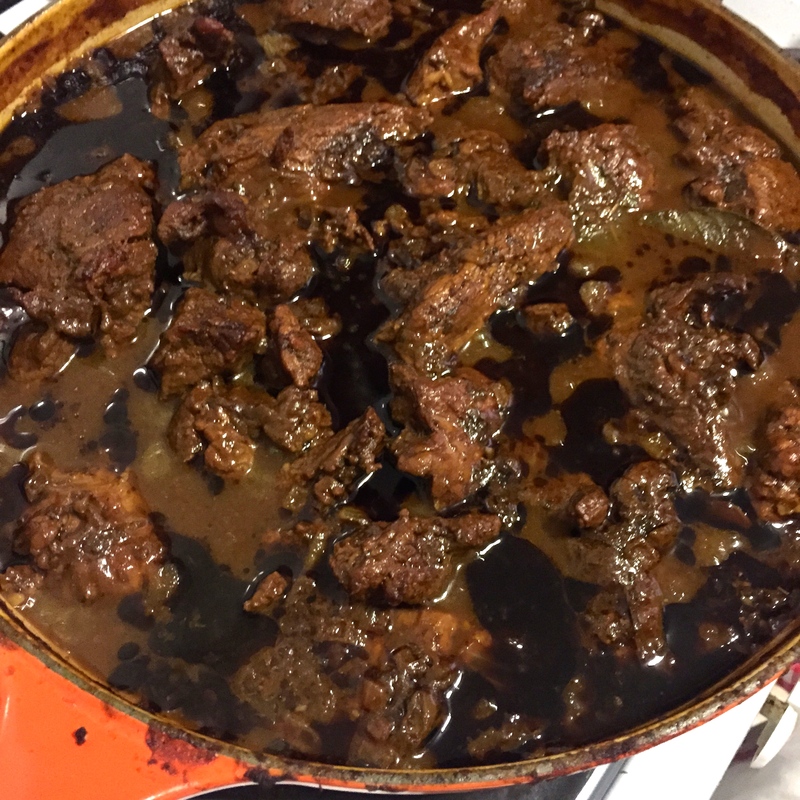 It’s something I do when making Indian lamb, and wanted to avoid the common complaint lot of people have that when they cooked the whole shoulder, it did not cook evenly through and there were some parts which would not yield themselves to being pulled. It is a bit of work cutting the meat up, but after that the tough work is pretty much done. The pork is really flavor full and tastes better the next day too. I just freeze the extra in small zip lock bags, and then you can have pulled pork tacos when ever you feel like as long as you keep some corn tortillas in the fridge or freezer. The first time I made these I had no, all spice powder and improvised using some Indian garam masala, it worked beautifully! The next time I actually put chinese five spice powder and again it was absolutely gorgeous with a different background flavor. I have finally got some more regular allspice and will try it with that next time, so use what you have as it’s a very versatile dish which can go in any flavor direction you like. 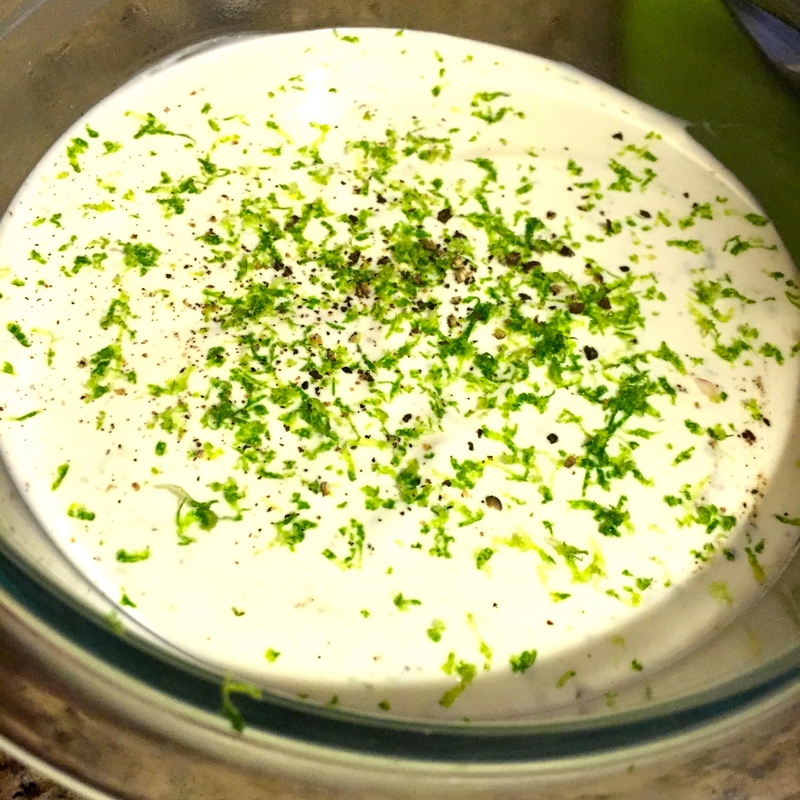 I have fallen in love with lime creama since I first made it, and so love it with my taco’s, but simple sour cream would do too. The pickled onion are amazing and vinegary and provide a sharp crunchy contrast to the beautiful rich flavors of the pork. I also like a bit of thinly sliced radish and some red or green cabbage for crunch. A sprinkling of chopped fresh jalapeño chillies is always welcomed by me. The green salsa is also a nice touch if you have any jars of it in the fridge. 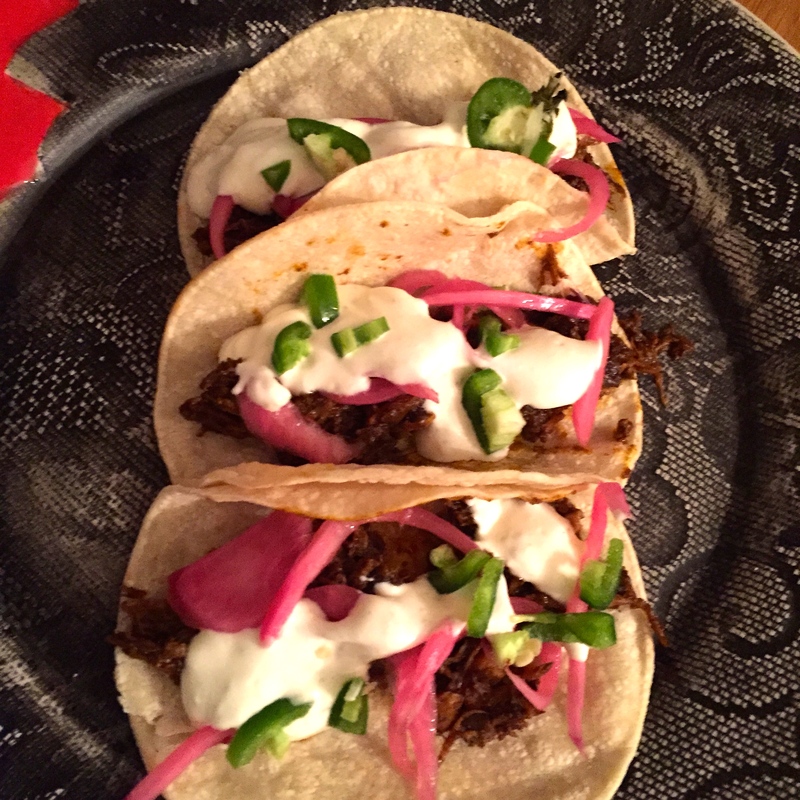 These pulled pork tacos really are amazing and became my daughters and husbands favorites! You could also make pulled pork sandwiches or eat them with rice I suppose. But I just love mine as zingy taco’s. These really are the bomb! A good way for warming the tortillas before you assemble your taco’s is to just use tongs and place them straight on the burner of your gas stove. Just get a few char marks on both sides and wrap in foil to keep warm. Corn tortillas taste much nicer cooked this way than if they were warmed through in a dry frying pan. 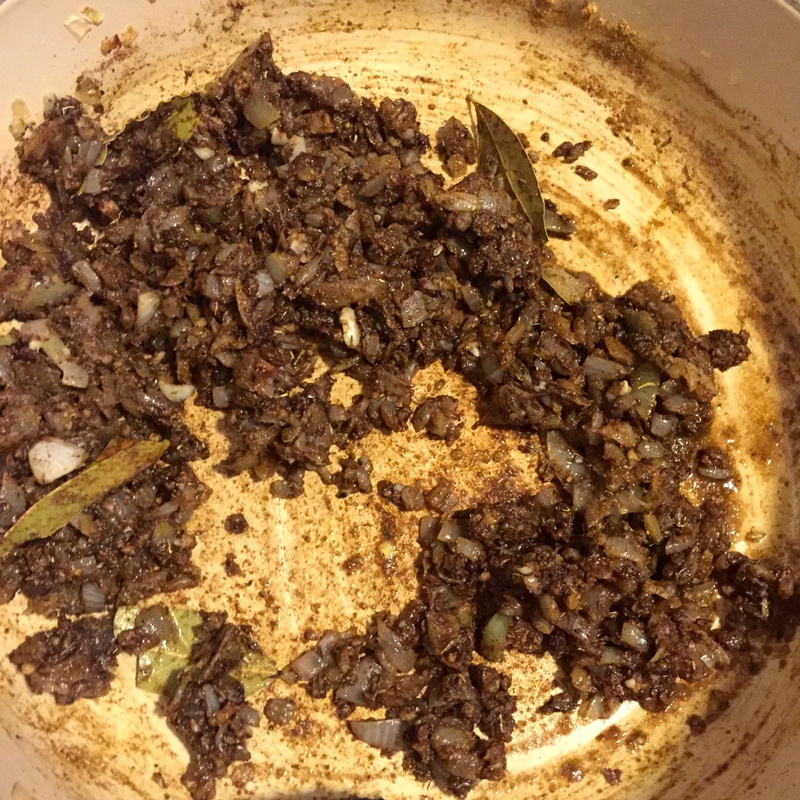 Place chiles in a small saucepan. Add enough boiling water to cover, Cook for two to three minutes and let them soften. Alternatively you can soak them in boiling water for 30 minutes and set a small plate or bowl on chiles to keep submerged. Drain chiles, reserving 1 cup soaking liquid. Place chillies in your blender along with a cup of the soaking water and reserve the rest of the water incase you need it later. Place chiles, sugar, lime juice, 1 tablespoon white vinegar. Purée chile mixture, adding more soaking liquid as needed to form a smooth paste. Heat oil in a large heavy pot over medium heat. 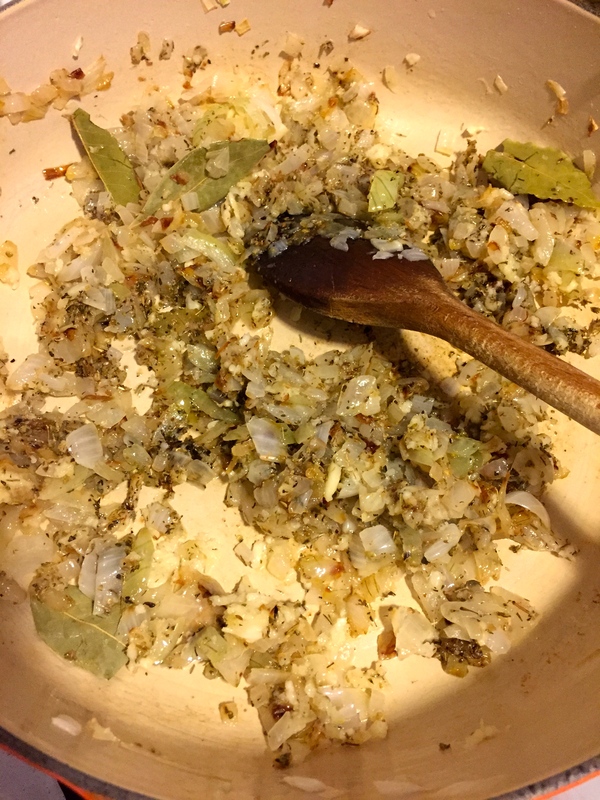 Add onion, garlic, bay leaves, oregano, coriander, cumin, and allspice. Cook, stirring often, until onion is soft, about 8 minutes. Add pork to pot and stir around for a couple of minutes. Now add the blended chilli mixture and stir into the pork. Add salt and cook for five minutes. Now add the beer and bring to a boil. Cover and transfer to oven. 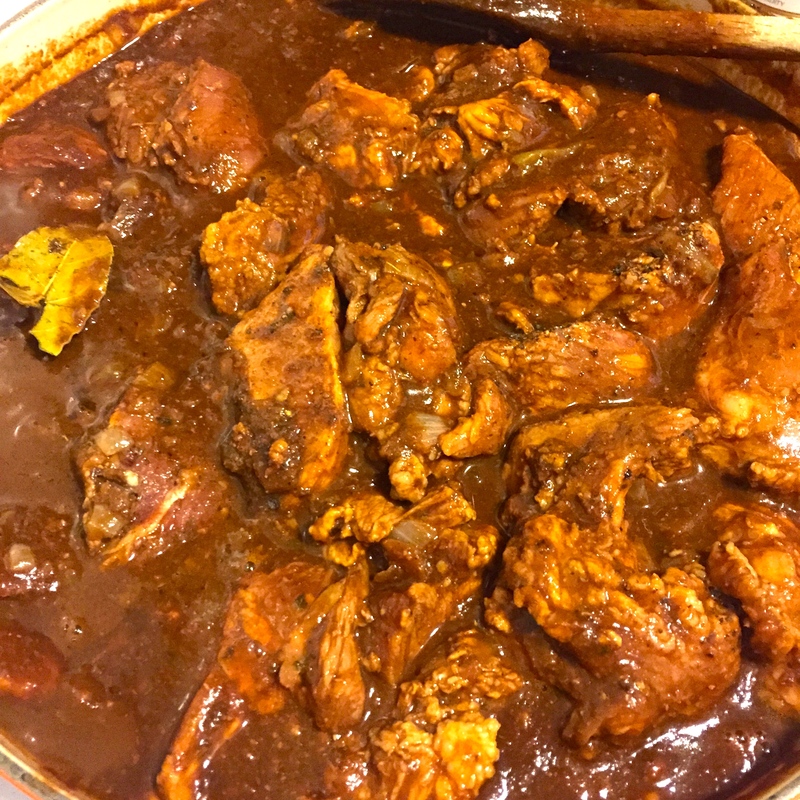 Braise pork, basting occasionally with pan juices, until very tender, about 2 ½ hours. Let cool slightly. 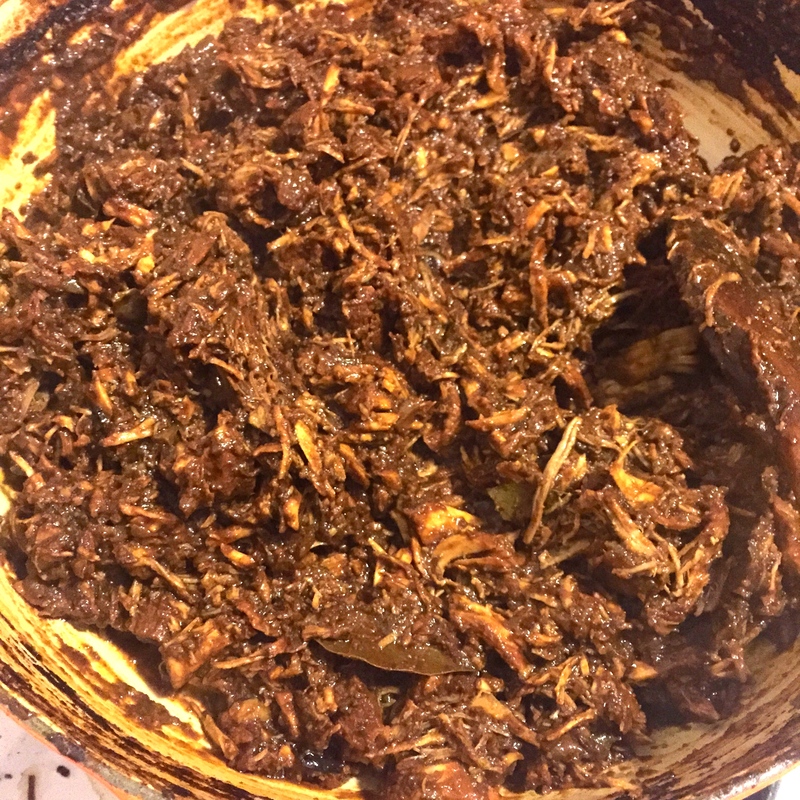 Shred the pork with 2 forks or the back of a wooden spoon and mix around to coat the pulled pork evenly with the sauce. Meanwhile, working in batches, cook tortillas in a large heavy skillet over low heat until toasted, about 1 minute per side. Transfer to a large sheet of foil; wrap to keep warm. 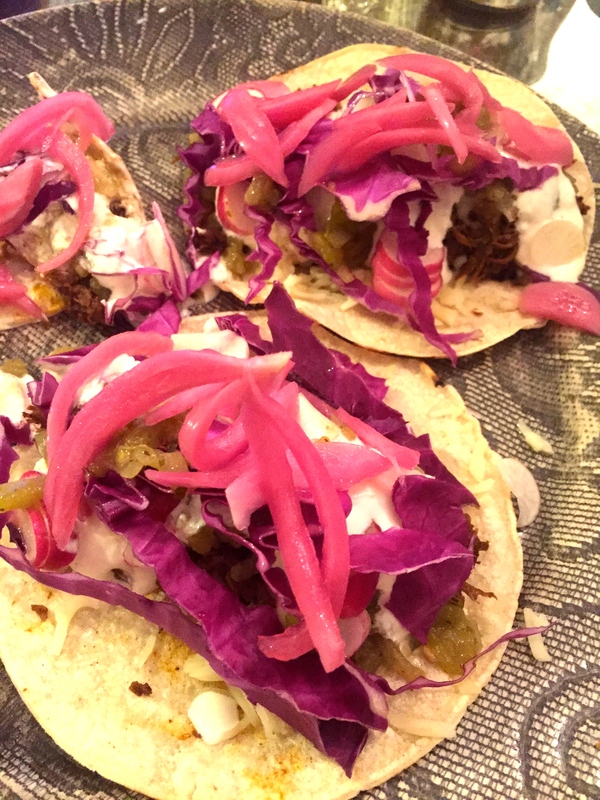 Serve pork with tortillas, radishes, both salsas, pickled onions, and chopped cilantro, encouraging guests to fill and garnish tacos as desired. 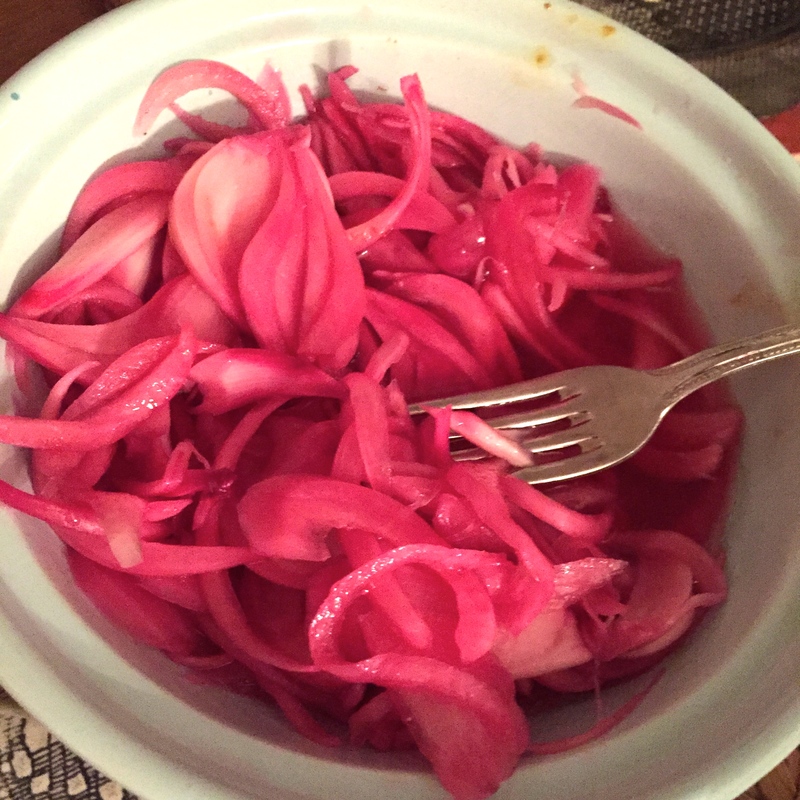 Place onion slices in a medium bowl. Pour vinegar and 1/4 cup warm water over onion. Stir in sugar and season with salt; let stand until slightly pickled, about 30 minutes. Drain. DO AHEAD Can be made 2 days ahead. Let cool slightly. Cover and refrigerate. 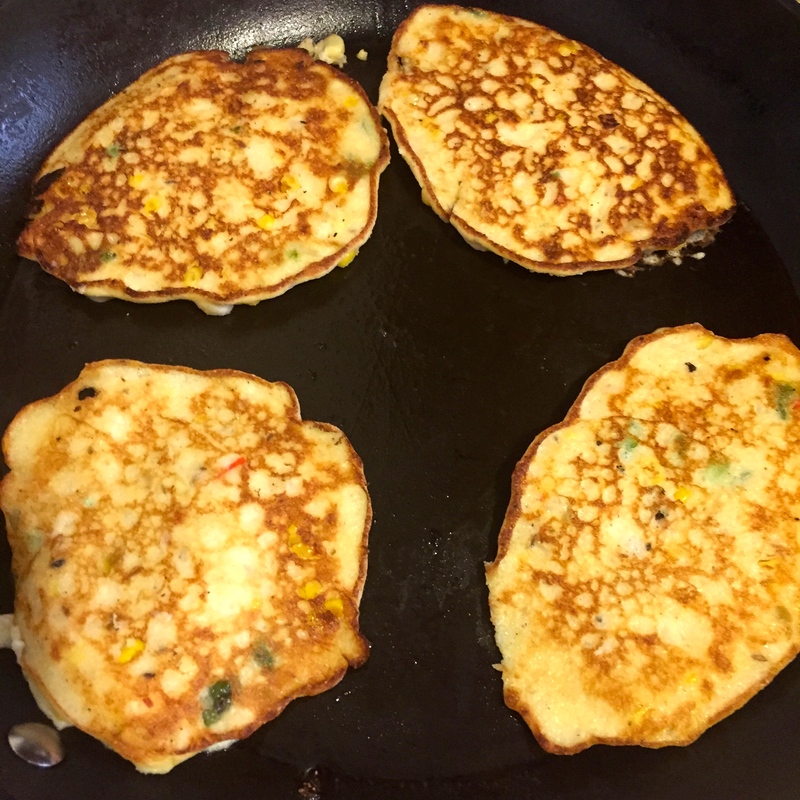 These fritters are beautiful and light with sweet delicious fresh corn coming thorough in every bite. I think it’s a great weekend brunch dish which I made because I had two ears of beautiful fresh corn from the farmers market, and knew not what to do with them other than the usual grilling or boiling! 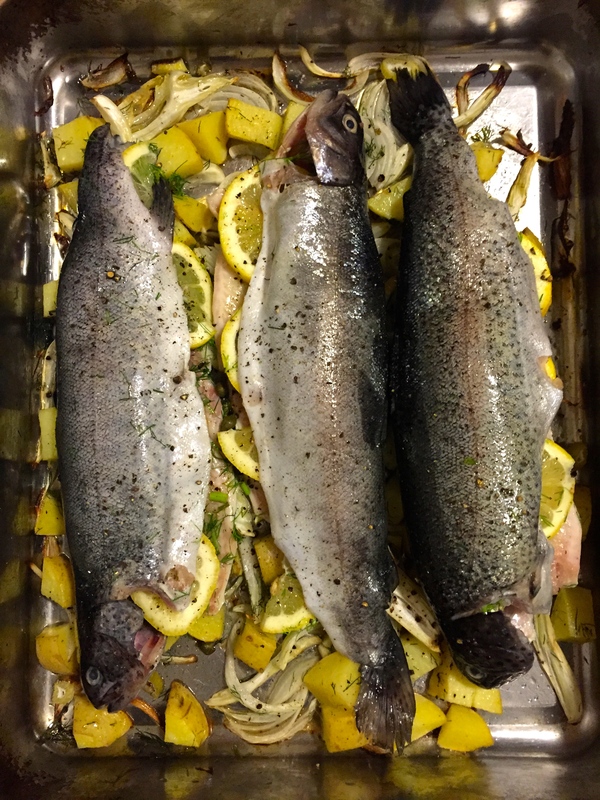 So when I cam across this Ottolenghi recipe, I was happy to give it a go, and so glad I did! I happened to have all the ingredients at home other than the fresh coriander and it worked beautifully well even with out it in the salad. 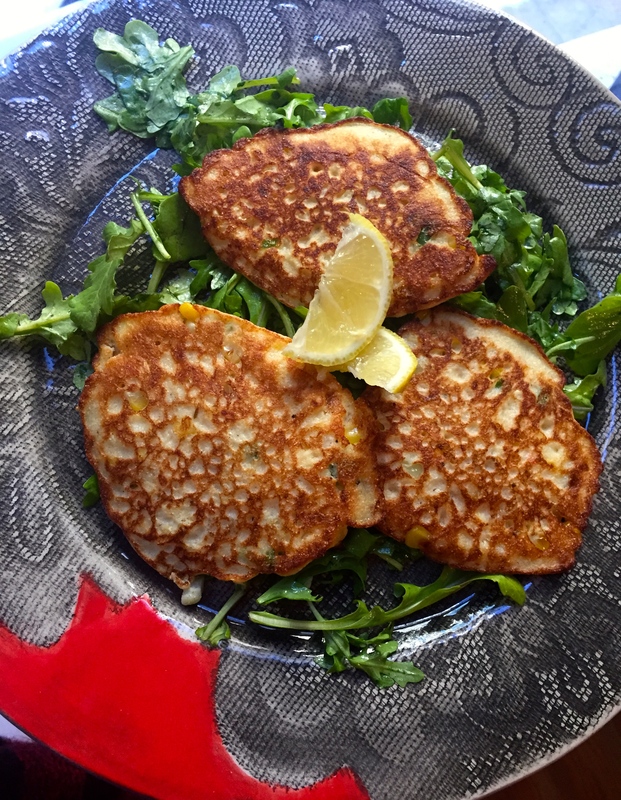 Using quick cooking polenta or fine ground cornmeal in this recipe makes the “corny” flavor come out even more! Incase corn is not in season where you are, thawed frozen corn would work too. I also gave them a bit more spice by adding half a teaspoon of coriander power and some chopped red birds eye chill to the mix apart from the recommended cumin and jalapeños. The Australian in me was crying out to eat them with a bit of sour cream and Thai sweet chili sauce, and I think with it they were just perfect! Even if you have only two eating, I suggest making it for four and eating the remainder as snacks or lunch the next day. They will disappear pretty quickly. 1. 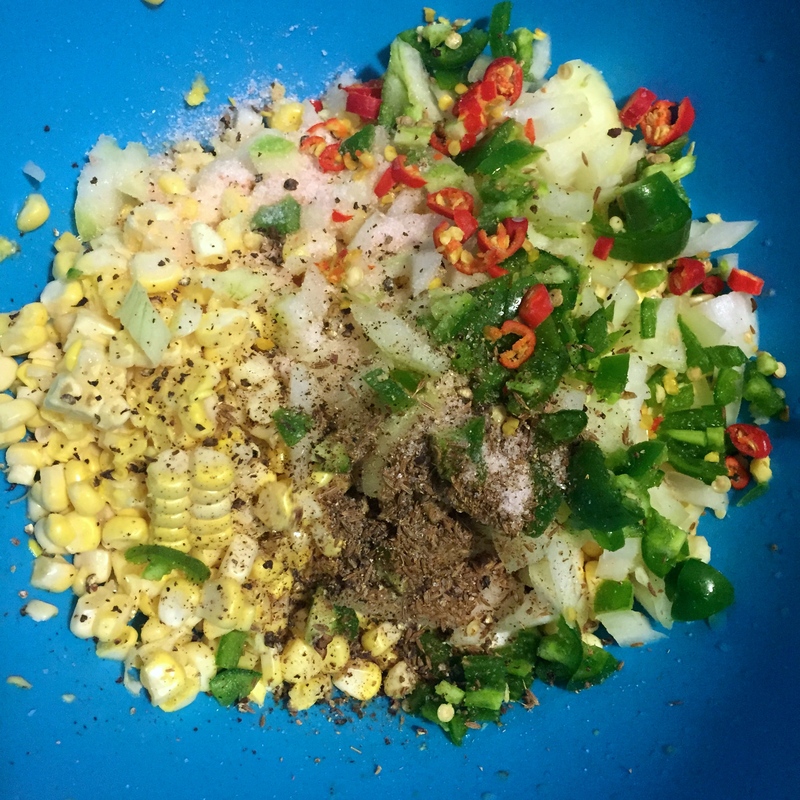 In a large bowl mix polenta with corn, shallots, jalapeño, cumin, salt and pepper. 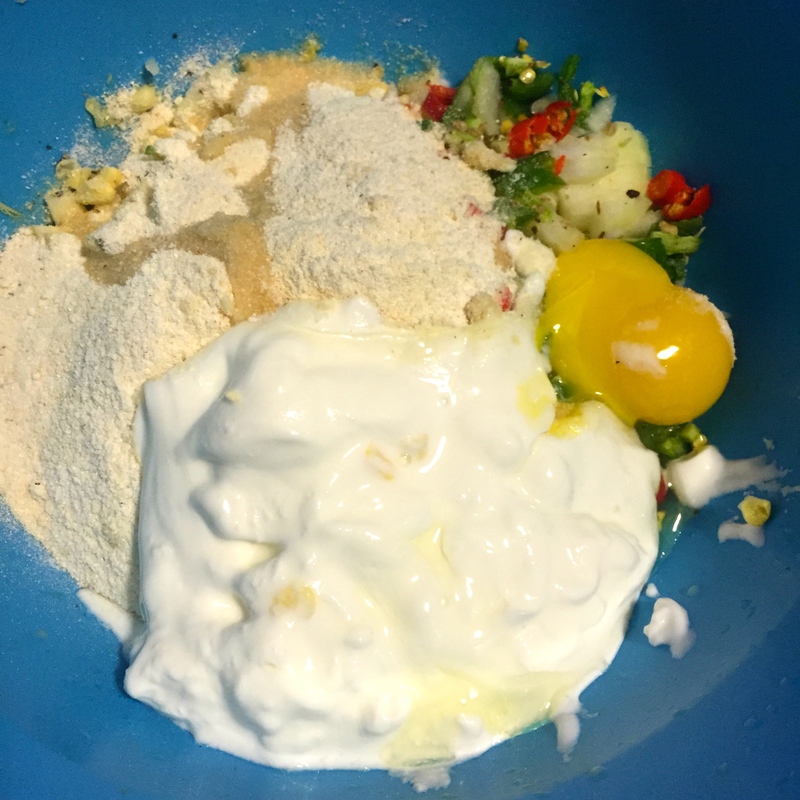 Add yogurt, 1½ tablespoons olive oil and 1 egg yolk (discard the other two yolks). Mix well with fork. 2. In a separate bowl, beat all egg whites to soft peaks. 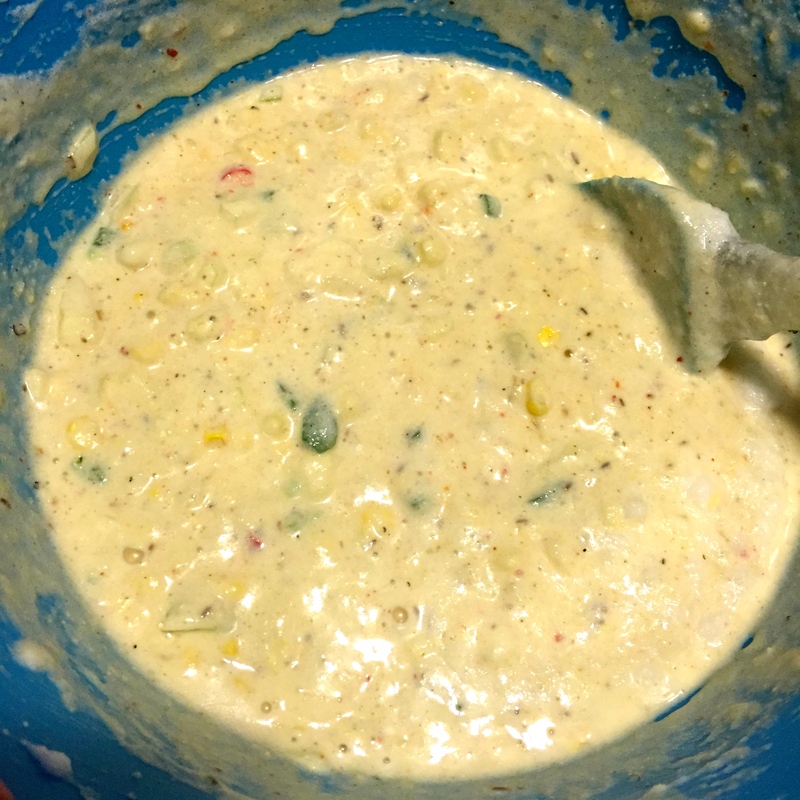 Carefully fold whites into corn batter in two stages. Let rest 5 minutes. 3. Meanwhile, make dressing. 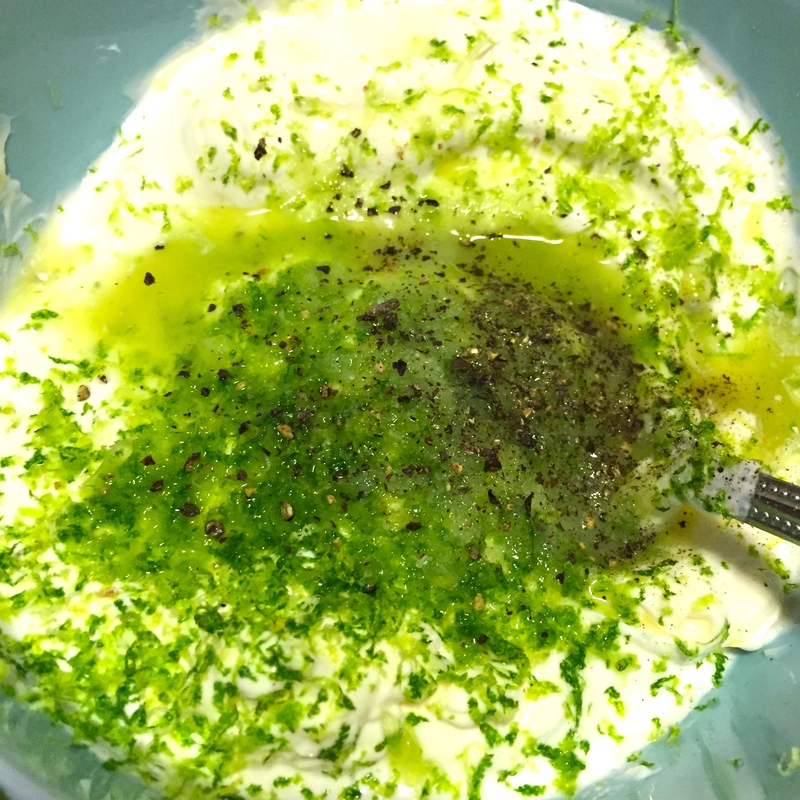 Whisk 1½ tablespoons olive oil with lemon juice. Season with salt and pepper to taste. 4. Set large nonstick frying pan over medium heat for 1-2 minutes. Pour in 1 teaspoon olive oil. Once hot, spoon 2 tablespoons of batter per cake into pan. Repeat until pan is full. Cook cakes 2-3 minutes, or until golden. Flip and cook 1 minute, or until golden. Transfer to paper-lined tray. Yield: about 16 cakes. 5. 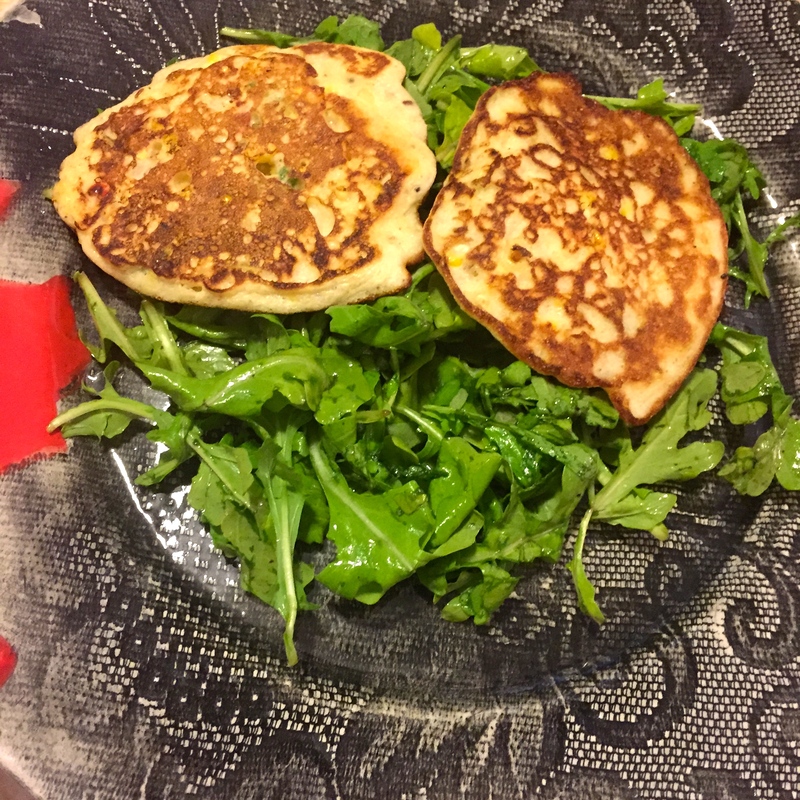 Toss arugula with cilantro. Add dressing and toss again. Season to taste. 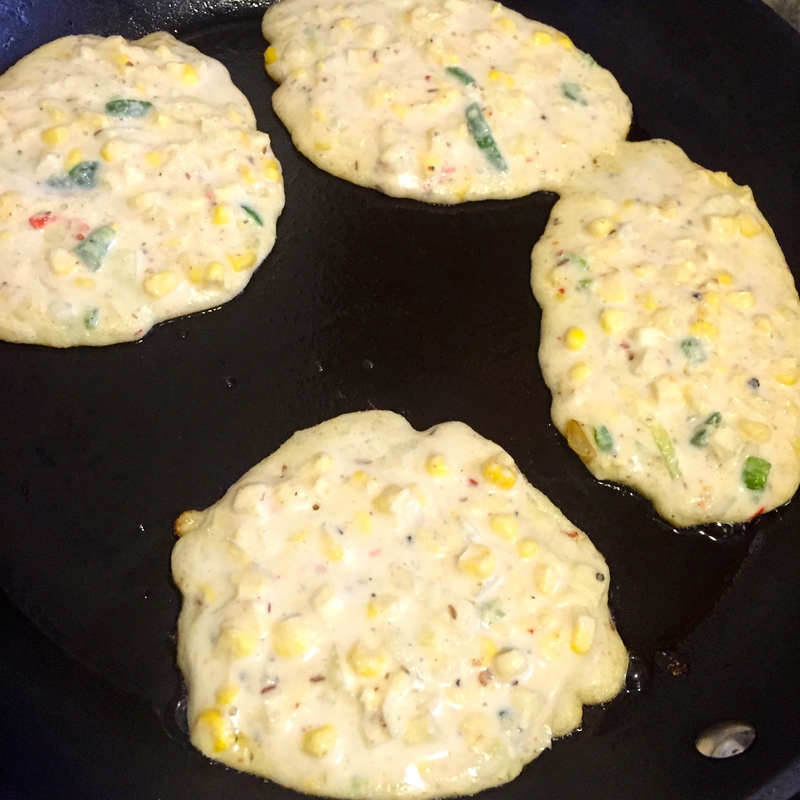 Serve corn cakes with a spoonful of sour cream alongside greens. If serving as an hors d’oeuvre, scatter cilantro over cakes before serving.